Dental implants, which are made of a biocompatible titanium alloy, serve as substitutes for the roots of missing teeth. They are not visible because, just like natural tooth roots, they lie beneath the gum line. Only the lifelike dental crowns that are attached to them are visible to you or anyone else. Once your implants are placed during a minor in-office surgical procedure, they will actually fuse to your jawbone in a process known as osseointegration. To facilitate that osseointegration process, we use implants made by BioHorizons. 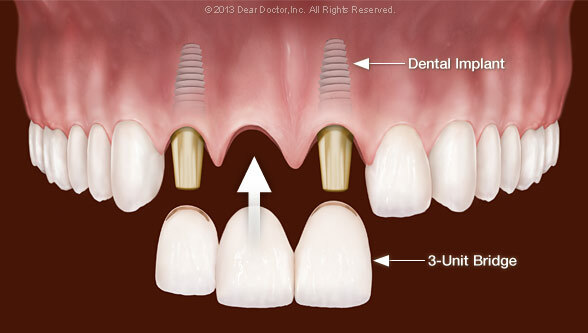 These implants have a uniquely engineered thread design that allows for incomparable initial stability of dental implants so that patients can receive teeth the same day as their surgery. The implants also have cell-sized microchannels created by lasers that can secure the attachment of gum cells to the implant, also unique to BioHorizons. The attachment formed between your jawbone and your implants will be permanent, which explains why implants are the longest-lasting tooth-replacement option. If you are missing more than one tooth, you do not necessarily need one implant for every tooth you are replacing. If the teeth you lost were all right next to each other, we may be able to create a dental bridge using implant teeth rather than natural teeth as supports (View Example). To do this, we will place implant teeth on either side of the gap left by your missing teeth. The remaining space between the implant teeth will be filled in with as many dental crowns as you need to bridge the gap. In other words, you will have a row of completely convincing prosthetic teeth, but only some of them will have implant “roots” beneath them. If your missing teeth are scattered throughout your mouth, however, you may need to have individual implants placed for each one, or a combination of bridgework and single implants. If all your teeth are missing, you have a choice of fixed bridgework, fixed dentures, or removable dentures — all of which can be supported by implants. We will go over all of your options in detail with you. Learn more about fixed vs. removable dentures. Learn more about all of your dental implant treatment options. Dental implant surgery is a simple, routine procedure carried out here in the dental office under local anesthesia in most cases. If you need to have failing teeth removed, that will be done first. After the area is numbed, the implants will be placed in your jaw at precisely planned angles and positions to maximize support and avoid anatomical structures such as nerves and sinuses. Depending on how many implants you need, the surgery can take anywhere from one to three hours. Most people who have dental implants placed find that any post-operative discomfort can be managed with over-the-counter anti-inflammatory medication such as ibuprofen or acetaminophen. Some don't need any medication at all. Usually, the implants will be left to heal for several months before any teeth are attached. During this time they will complete the process of osseointegration. You will need to go easy on your new implants during this crucial healing phase to ensure the best results. We will advise you as to what foods you should temporarily avoid. Of course, once the implants have fused and the permanent crowns are attached, you will be able to eat anything you want! At that point, the only thing you will need to do is take care of your implant teeth just as you would your natural teeth — with regular brushing, flossing, and periodic professional cleanings here at the dental office. With proper care, your implants should last a lifetime.